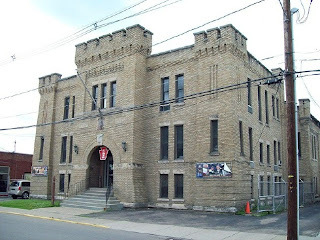 About 70 marijuana plants and a number of guns were taken from a Wellsville home after the Southern Tier Regional Drug Task Force executed a search warrant late Monday night. Besides the 67 mature marijuana plants that were about three feet high, police recovered about four pounds of process marijuana. 30-year-old John Roulo and 29-year-old Heidi Roulo are each charged with criminal possession of marijuana and unlawfully growing marijuana. They are both in Allegany County Jail. The investigation is continuing and police say they anticipate more arrests and additional charges being filed in the near future. 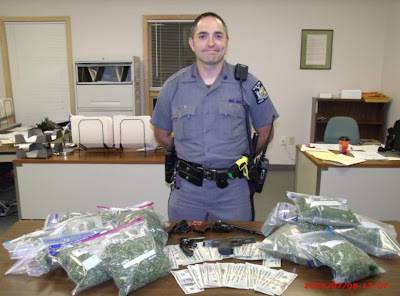 Pictured, Amity-based New York State Trooper Eric Tavernier stands with some of the items collected during a drug raid Monday night in Wellsville.